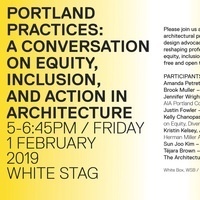 Please join us at UO Portland as we host a panel of architectural practitioners and representatives from local design advocacy groups for a wide-ranging discussion on reshaping professional practice and studio culture toward equity, inclusion, and political engagement. The event is free and open to the public. Food and refreshments will be served.